Maybe a radical fringe or maybe the ripe fruit of Islam, but the world should open it’s eyes to what can and does happen in the name of Islam. And not only in Nigeria but everywhere Muslims entrench themselves. Janet and I are flying from Rome to Tel Aviv. It is a comfortable flight but I am still nauseated. 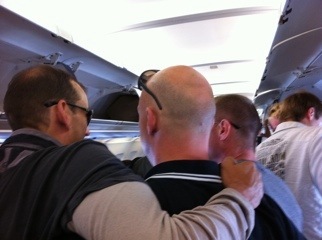 There are four Dutch gays on the plane in front of us and across the isle. I could spot them instantly and they are utterly disgusting. Heading to gay bars in Tel Aviv no doubt. Yuck! Makes me afraid I’ll lose my lunch. And we Americans are now celebrating Gay Pride Month in June — which I protested and opted out of (see below).